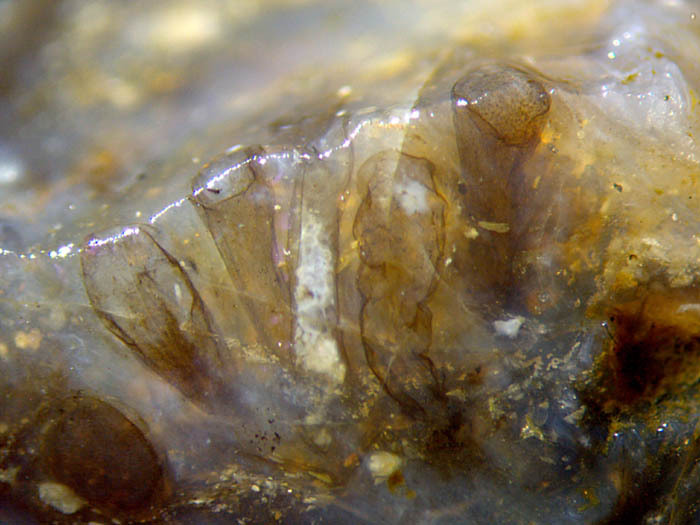 The bunch of funnel-shaped organisms in a small sample of Rhynie chert (Fig.1) has come as a surprise as it differs from any known fossil from that site. Apparently it is neither land plant, green alga, fungus, nor microbial formation. It resembles a xanthophyte, and if it really is one, it would be, according to  and other sources, the first fossil xanthophyte ever seen, since "There are no positively known fossils of the Xanthophyta, ...". To explain the reason why,  is quoted here again: "It is likely that the lack of a fossil record results more from the fact that their cyst morphology is poorly studied, rather than from a lack of preservation, since the silicified cysts of this group ought to be found." This plain situation, without any fossil xanthophytes through the ages, has apparently ended with the discovery of Palaeovaucheria , an alga more than twice as old as the Rhynie chert, interpreted as a xanthophyte in a "Gongrosira phase". Disregarding that dubious fossil from the Proterozoic, one can assume that the silicified cysts which ought to be found according to  have been found now. There are 8 funnel-shaped bags in this sample, 5 of which are seen here, more or less inclined towards the picture plane. Because of this inclination, their bases are deeper inside the sample and therefore not seen. 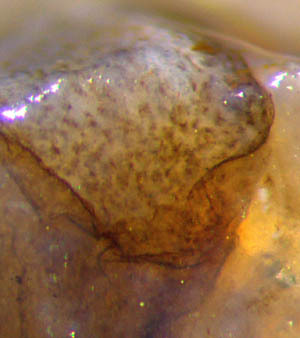 Fig.1: Bunch of funnel-shaped bags seen at the edge of a Rhynie chert fragment, resembling truncated cysts of the extant xanthophyte Botrydium. Width of the picture 5mm. From the outlines seen on the fracture faces it may be concluded that the bags or cysts had nearly axial symmetry. One of the bags, 2nd from the right, is the only one which had been subjected to slight vertical compression, the result of which indicates that its wall had been very flexible and thin, estimated 1µm or less. The top of the other cysts is missing, broken off when the small fragment was shaped by disintegration of the chert layer. Two not quite plane fracture faces meet at an angle of about 100° in Fig.1, hence their common (slightly rounded) edge is not quite straight, seen as a bright line due to reflection of incident light. The picture plane has been chosen such that it essentially coincides with that fracture face which reveals most of the bags, either as sections or as views through the transparent chalzedony. Fig.2 (far left): Detail on the sample front face cutting sideways into the funnel-shaped bag on the right in Fig.1, irregular outline due to local deformation before silicification. Width of the picture 0.75mm. Fig.3: Top view of the truncated cyst on the right in Fig.1. Width of the picture 0.75mm. The above claim of the discovery of a fossil xanthophyte is substantiated by details from these images. 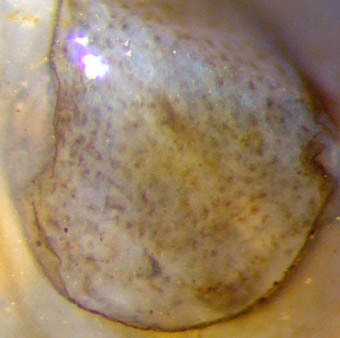 An epidermis is conspicuously absent, and so is any tissue, although the interior of some bags is clearly seen to be filled rather evenly with fuzzy dots of about 20µm. Other bags are empty. This is compatible with Botrydium, which is characterized by large numbers of nuclei and chromatophores within a giant cell attached to moist soil . When the place is flooded, the nuclei and plasma turn into zoospores which escape through an opening. Judging from the layering of the Rhynie chert, flooding had occured repeatedly in the habitat which brought forth the chert, which may explain why some of the bags in Fig.1 are empty. The apparently shapeless dots in Figs.2-4 had possibly been in some stages of transformation into zoospores when being silicified. As another option, the giant cells of Botrydium can become empty by producing and releasing gametes . 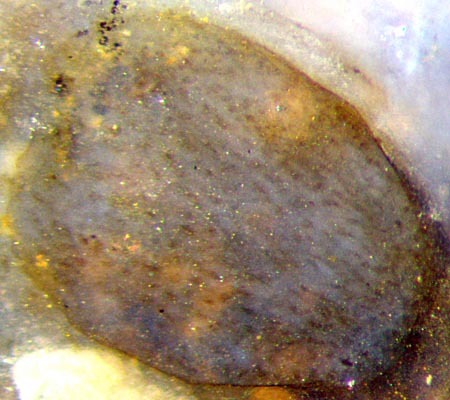 Fig.4: One of the bags in Rhynie chert resembling cysts of the extant xanthophyte Botrydium, inclined section on the fracture face in Fig.1 below left, seen here filled with nuclei (and chromatophores ?). Width of the bag 0.75mm. Preservation in Rhynie chert had been governed by the competition of decay and silicification. In the present case, another process had also been relevant: Flooding could have initiated the formation and release of zoospores or gametes, similar as with extant Botrydium . Silicification interfered with this process so that the motile unicells managed to escape from some of the tubes in Fig.1 before silica gel formation but not from others. Hence, one should anticipate the presence of fossil bunches of empty cysts which could easily be misinterpreted as land plant cuticles. Finally it can be assumed that, disregarding the Proterozoic, the above images show the first fossil xanthophyte, representing a 400-million-years-old one out of this class of algae with about 600 extant species . Photographs taken from the raw surface of a Rhynie chert fragment of 20g found by Sieglinde Weiss in 2014. R. E. Lee: Phycology, p417. Cambridge 2008. N.J. Butterfield: A vaucheriacean alga from the middle Neoproterozoic of Spitsbergen.